For the football club, see Club Atlético Lanús. 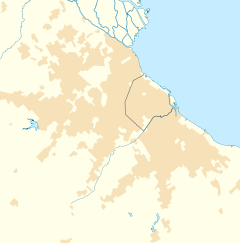 Lanús (Spanish pronunciation: [laˈnus]) is the capital of Lanús Partido, Buenos Aires Province in Argentina. It lies just South of the capital city Buenos Aires, in the Greater Buenos Aires metropolitan area. The city has a population of 212,152 (2001 census [INDEC]), and the Partido de Lanús has a total population of 453,500. A major industrial centre, it is served by freight and passenger railway lines. The city has chemical, armaments, textiles, paper, leather and rubber goods, wire, apparel, oils and lubricants industries, as well as tanneries, vegetable and fruit canneries. Several technical schools are located in the city, as well as the Eva Perón Medical Center, one of the largest in the Greater Buenos Aires area. The city has a football club, Club Atlético Lanús currently playing in the Argentine Primera División. Club Atlético Lanús also has a basketball team. Guillermo Gaebeler initiated the town's development, designing its first city master plan. Gaebeler established the town as Villa General Paz on October 20, 1888, and named its first streets and plazas after the numerous battles won by General José María Paz in the Argentine Civil Wars of the mid-19th century. Lanús was officially renamed in 1955 in honor of Anacarsis Lanús, who owned the land where the city is today located until his death in 1888. Sergio Olguín - writer, journalist and editor; wrote a novel, Lanús.